I eventually got to Palaiochora just before lunchtime on Thursday. While I was waiting for my room to be ready I reacquainted myself with the town, and walked around for a couple of hours. From one beach to the other, and a climb up to the Castro at the end of the peninsula, did the trick. A cappuccino and sandwich at the Castelli snack bar above the sandy beach also helped. I checked in and then just rested at the hotel for a couple of hours – after all the travelling I was ready for that. Although the weather was better – it wasn’t raining, for example – it wasn’t very warm either so sitting on the beach wasn’t quite right. Eventually I decided it was time to go out and eat, and I had a Cretan meal in a traditional taverna, ‘Portofino’, overlooking the stony beach. I had a Graviera Saganaki starter (a fried breaded cheese dish – very tasty) followed by “lamb and potato from the oven”, which was also good if very filling. Then back to the hotel for an early night. Friday was the highlight of my stay in Palaiochora. Starting just after 10 o’clock I walked up to Anidri village, about three miles away. 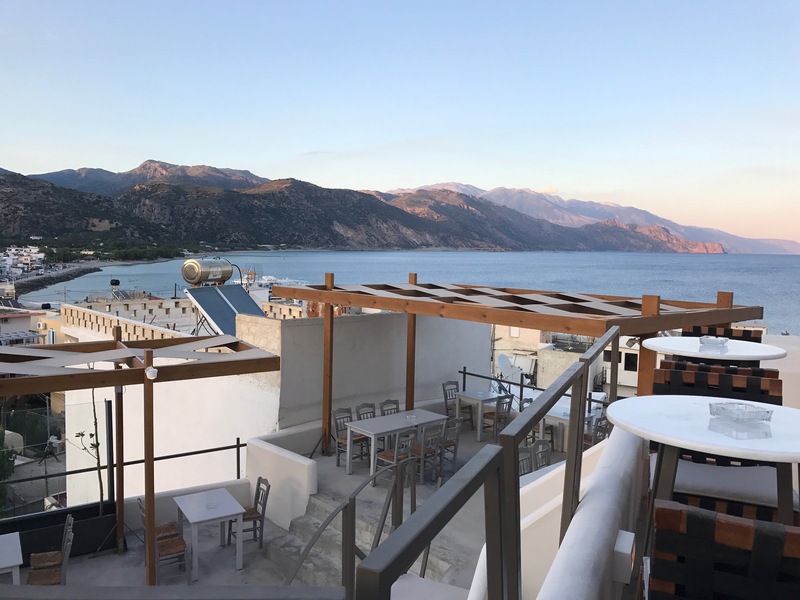 There’s a good kaffeneion there in the old schoolhouse at which I enjoyed the best cheesecake in the world, but the main point was that Anidri is at the top of the eponymous Gorge, which leads down to Giaskala beach itself about three miles from Palaiochira. Immediately after starting the gorge path I found the old (14th c.) chapel of Agios Giorgios – St George – complete with frescoes of him slaying the dragon. The chapel is very small and very peaceful, and well worth a visit. Then it was on down the gorge. This took about an hour, so it was much simpler, shorter and easier than last year’s walk down Samaria gorge. Nonetheless it was a very enjoyable walk. At Giaskala beach there’s another taverna where I enjoyed a glass of fresh orange before the walk back along a dusty road back into Palaiochora. I’ll admit, this section was somewhat underwhelming. Then it was back to the hotel at just after 3 o’clock. I ate in Portofino again that evening, this time rather less successfully – “beef from the oven”, which was tasty enough but of which there was a huge amount. Saturday was my last full day in Palaiochora, and I spent it exploring the beaches. In the morning I walked out along the road leading westwards of the town, along the sandy beach, and then walked back along the beach itself. I paddled! 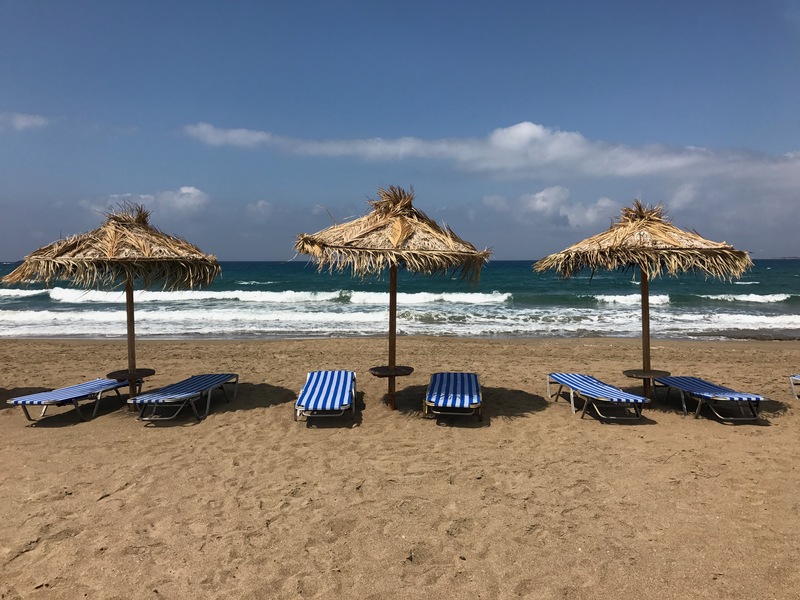 The weather was sunny and warm, but again there was a stiff breeze which was hitting the sandy beach hard and it wasn’t the right place for sitting on a lounger. So I headed up to Castelli again and had my first serious junk food of the holiday – a club sandwich + fries, which was in fact delicious, and which was followed by a glass of draft Alpha. 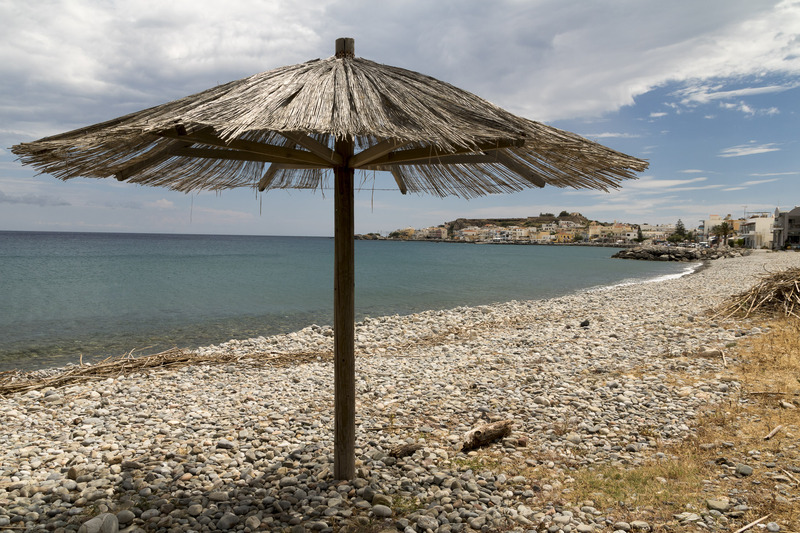 In the afternoon I put on my swimming gear and walked up the stony beach to a beach club – Perla Cove – where I bagged a lounger and enjoyed an hour on it. This beach is out of the wind. I did try going on for a swim but the beach is, as I’ve mentioned, stony underfoot (and thus painful), while the rocks that are permanently under water (even just a few inches) are very slippery, so I thought better of this. As an alternative I headed for the bar above the beach and let the barman mix me a gin and tonic. Then back to the hotel – slowly. I spent the main part of the evening having first a cocktail and then a meal at Castro, a restaurant/cocktail bar on the way up to the the actual castro. It’s stunningly located, high up above the town, but the wind got up and I was in shirt sleeves, so I ended up very cold. The plate of pasta was excellent, however, and the glass of raki at the end had a certain warming effect. Either that or it helped me stop worrying about the cold…. A quick trip back to the hotel was followed by a visit to Monica’s Garden, Palaiochora’s best (only?) wine bar where a glass of cretan wine was enjoyed. Then back to the hotel for the last night. The following morning it was time to move back to Chania. One last look around Palaiochora after breakfast, finish packing, and then I was on the midday bus.